Dubai, UAE: Arabian Automobiles, the flagship company of AW Rostamani Group and the exclusive dealer for Renault in Dubai and the Northern Emirates, has launched the Renault Talisman, the flagship in the sedan segment. The all-new 2017 Renault Talisman is fully customisable for up to 6 profiles, with advanced technological features, tailoring the driving experience to each individual’s preferences and mood. With 190 Brake Horsepower (BHP) under its wing, the car offers matchless power in line with the D segment models. The Renault Multi-Sense system has fully adaptable road handling and offers five different driving modes, dashboard display and lighting environment. Complementing the experience is the advanced R-Link 2, 8.7 inch connected tablet with touchscreen display, the largest in its segment. The tablet features a widget system that offers one touch access to multimedia, road navigation assistance with just the tap of a finger. It connects the R-Link infotainment system and a Bose surround system spread across 13 high-performance speakers. Sleek and fluid contours flow through an elongated exterior which spans the length of this family-sized sedan. The engine offers comfortable driving and fuel economy, coming fully equipped for rapid energy recovery during braking. Customers will also discover hands-free convenience provided by automatic trunk opening from detection of foot movement under the rear bumper and 25 litres of storage space located throughout the cabin. High levels of safety are provided by side pelvis and chest level airbags available in the front seat, as well as rear curtain airbags. An electric parking brake also features in addition to rear parking sensors. 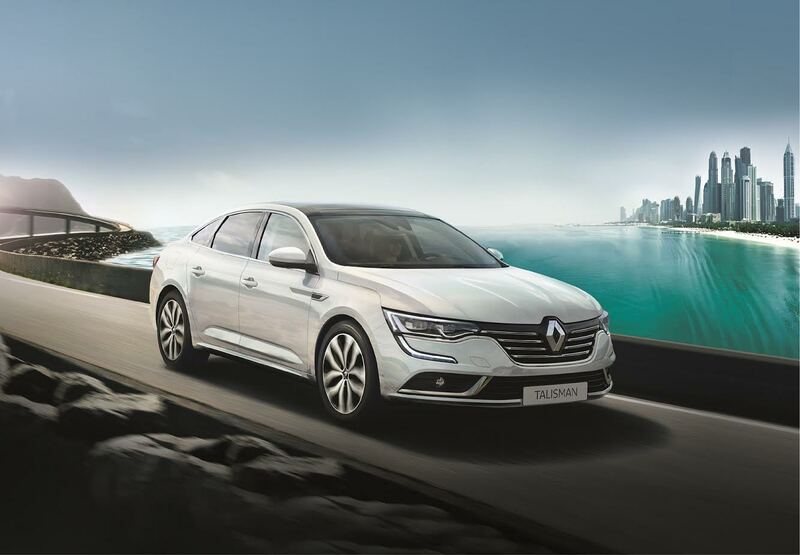 Those interested in the latest Renault model are encouraged to visit their nearest Arabian Automobiles Renault Showroom where they can test drive the Renault Talisman, with a starting price of AED 67,900, to discover the all-new features for themselves.